Who’s excited for Broadway’s The Addams Family?! 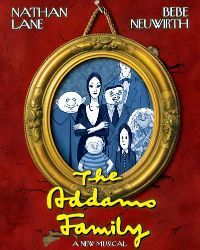 The new musical The Addams Family, based on the characters that made Charles Addams famous, will officially open at Broadway’s Lunt-Fontanne Theatre on April 8, 2010. Previews begin March 4, 2010 following the show’s out-of-town run in Chicago (which begins on November 13, 2009). Starring Nathan Lane as Gomez, Bebe Neuwirth as Morticia, Terrence Mann as Mal Beineke, Carolee Carmello as Alice Beineke, Kevin Chamberlin as Uncle Fester, Jackie Hoffman as Grandmama, Zachary James as Lurch, Adam Riegler as Pugsley, Wesley Taylor as Lucas Beineke and Krysta Rodriguez as Wednesday, this Stuart Oken, Roy Furman, Michael Leavitt and Five Cent Productions produced show is getting a lot of pre-opening attention. The Addams Family features a book by Marshall Brickman and Rick Elice (Jersey Boys), music and lyrics by Andrew Lippa (The Wild Party), direction and design by Phelim McDermott and Julian Crouch (Shockheaded Peter, The Metropolitan Opera’s Satyagraha) and choreography by Sergio Trujillo (Next to Normal, Jersey Boys). Seriously – with all of those names involved and some of the most darkly quirky characters of all time … I don’t know how this show could possibly go wrong. 1 Comment on Who’s excited for Broadway’s The Addams Family?! And this is the main reason I love broadwaymusicalblog.com. Nice post.